The Purpose of Lab 3 was to give an introduction on cartography in ArcMap through the production of a map orginally produced by the Utah Geological Survey. The map is a subset of the larger 30' x 60' Logan Quadrangle, focusing on the area immediately around Logan, UT. All symbology and data comes from the original Utah Geological Survey map. Though initial work was performed in ArcMap, I used Adobe Illustrator for the final layout. Using a 3rd party program such as Illustrator can be a hassle when importing the file, but it has greater layout functionality and flexibility in creating documents for output. The lab did a good job of highlighting the work that goes into converting raw vector and raster data into a professional looking map. Many steps were required to create the map product. I worked hard to create a map that conveyed all the information required without being cluttered. While some may quibble with the amount of white space in the image, I wanted to constrain the dimensions of the image to a printer friendly size. A letter size canvas proved to be too small, so I went up to a tabloid size, which resulted in some of the white space seen. A print quality PDF version of this map is also available: A Portion of the Logan 30' x 60' Quadrangle. For the second part of the lab, we were required to create charts showing the major (greater than 5%) rock units in the map. The major units accounted for 73.37% of all units shown, with the Provo Formation being the largest unit. For the charts, the Middle medium-bedded limestone unit of the Monroe Canyon Limestone is referred to as Monroe Canyon Limestone for formatting reasons. Charts were created using ArcMap in order to show the ability of that software to create graphs for export. Click on each image to enlarge. The assignment provided an example chart using a pie chart, which I have reproduced above. I am strongly against using pie charts in any context, I believe that they are at best hard to read and at worst misleading. The pie chart above implies that the data sums to 100, when in fact it omits over one quarter of the data. This could have been rectified by the inclusion of an "other" category, but that presents its own set of problems. At 27%, "other" would have represented the second largest rock unit type. In addition to that issue, it is hard to compare different data types against each other and without labels it would be hard to estimate values. It is possible, but the structure of the chart makes it difficult for good comparisons. All of these issues are removed if you present your data in a bar chart, which is makes it easier to compare across rock units and get values for each result without the need to show labels for each units. 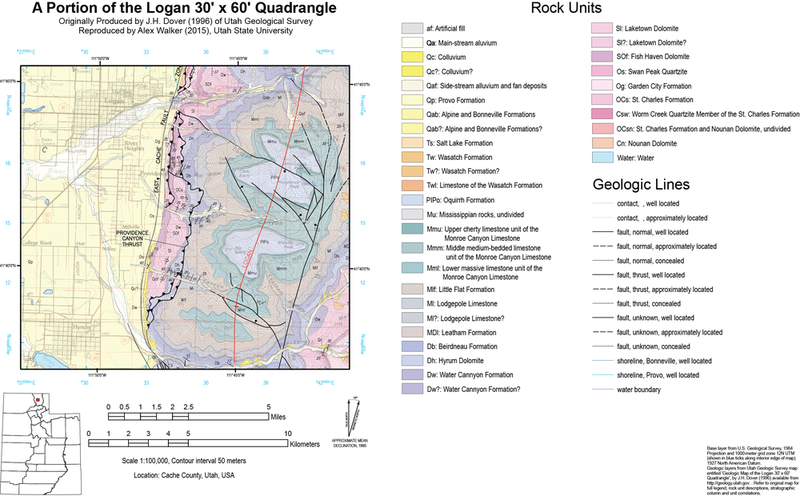 Geologic Maps at the Utah Geological Survey - learn about the geologic map product available for Utah and some background information on maps here.